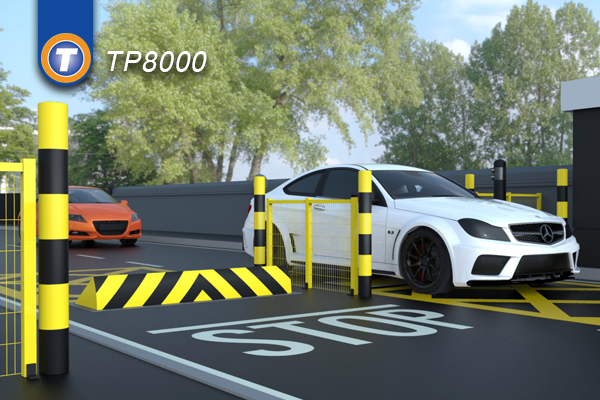 Automatic Rising Kerbs are tough, reliable and un-compromising, providing the perfect solution for prevention of unwanted vehicle access in both manned and unmanned vehicle parking areas. The TP8000 provides an excellent deterrent against the most determined intruder. It is manufactured from welded rectangular hollow section frame and chequered top plate. It also features an advanced hydraulic power pack to raise and lower the unit smoothly. A programmable logic controller coordinates the hydraulics, access control and traffic light signalling system. The TP8000 rising kerbs are fully welded and have a robust construction enabling them to operate in the harshest of weather conditions. Available in widths of 2.0 to 5.0 metres and three heights from varying security levels; 340mm Height for cars and vans, 500mm height for high security and 800mm height for ultimate security against HGV’s. The rising kerbs are fully automatic and utilise high quality hydraulic technology, meaning a long durable life requiring minimal maintenance. The galvanised and MMA flex grip paint finish ensures the highest visibility for vehicles approaching whilst also ensuring a long lasting finish for many years to come.